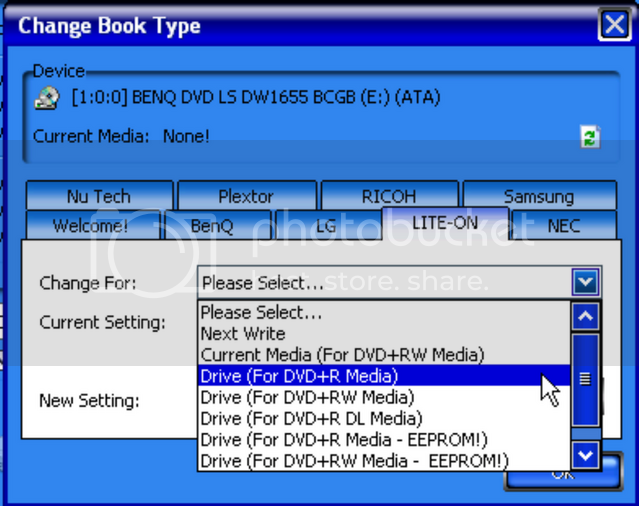 Description: Short basic guide on how to set the booktype of a DVD with ImgBurn to make the DVD more compatible with stand alone DVD players. Use the bitsetting (Set Booktype) feature in your bitsetting software to set your DVD+R/DVD+RW/DVD+R DL Media (Only DVD+R/+RW Media) backup to DVD-ROM for much higher compatibility with older DVD players and Game Consoles such as XBOX and PS2. Bitsetting is done during the burning process when bitsetting DVD+R Media. DVD-R Media Bitsetting, Booktyping is at the moment debatable [DVD-R Bitsetting Thread]. How to tell if the disc you burned is already booktyped to DVD-ROM? - Read the disc using programs such as DVDInfoPro, Nero CD-DVD Speed, DVD Identifier, or Imgburn to read your (already) burned DVD Media. A long story short, booktyping is a way of writing your media that tricks your standalone player into thinking it is reading a commercially pressed DVD to widen the compatability of recorded media among standalone players. This is an especially good idea to do when using DVD+R DL media as some players have a hard time recognizing burnt dual layer discs. Open Imgburn and go to Mode -> Write. Click on the icon in the lower right hand side that looks like an open book. This will open your booktype selection screen...choose your drive manufacturer from listings in the tabs along the top. In the top drop down menu choose the media you are using for your backup...typically this will be DVD+R or DVD+RW. In the bottom drop down menu choose the booktype you wish to record your media to....typically you will want to use DVD-ROM. Click change. A new window will pop up and tell you whether or not you succesfully changed the booktype of your drive. 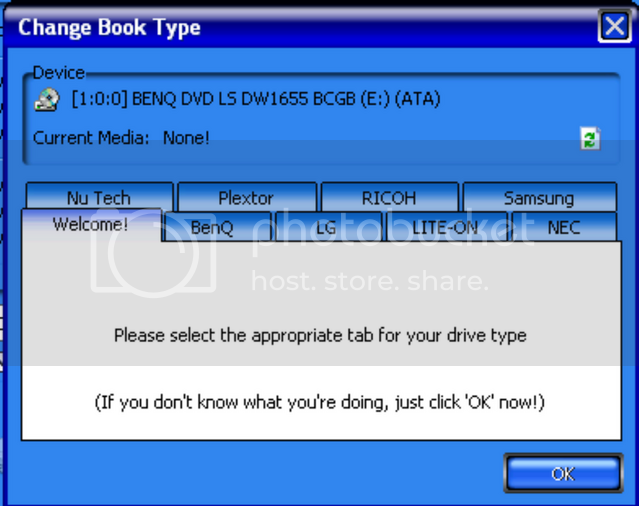 Note: For most drives, once you have successfully changed the booktype of your drive this becomes the default setting and will record all media to DVD-ROM in the future until you change the setting back to the physical characteristics of the disc being used (see post by blutach below). If you are unsure what drive you are using the model number and manufactuer can be found in the information window in the upper right hand side of Imgburn's main window in write mode. BENQ DVD LS DW1655 BCGB (ATA) <- This is my drive...listed from left to right is the Manufacturer (BenQ), then the model number (DW1655) and finally the firmware version (BCGB) being used. If you are still unsure what drive you are using you can plug the information that Imgburn gives you into this site and determine the manufacturer from there. Note: Not all drives are capable of performing this function.